Size 6 1/4" X 9 7/8"
Size 3 7/8" X 7 3/4"
Hex sizes 1/4 and 3/4 inch. For No. 6 to 1/2" bolts and nuts sizes. Size 5 1/4" X 9 3/4"
Top and side views of machine and cap screws. Size 6-1/4" X 9 7/8"
Top and side views of standard metric screws. Size 4 1/4" X 9 3/4"
47 sizes from 1/8" to 3" diameter. Size 5 3/4" X 9 7/8"
Has cut-outs for both bolts heads and double chamfered nuts. Hexes range from 1/8" to 3/16" across flats. Size 5 1/4" X 9-3/4"
Eleven sizes 1/4" to 1 1/4" Diameter. SCALE 1" = 20' and 40' Size 4 1/6" X 7-5/8"
Pocket template for Surveyors, and for drawing plot plans. Size 4 1/2" X7 3/4"
Contains most electric and electronic symbols. 1/4" SCALE. Size 6" X 7"
for metal or wood casement sash. 16 standard sizes can be drawn with this window template. This window template draws 18 standard sizes of double-hung windows. Slide-easy lower strips. This window template draws 16 standard sizes of awning windows. 1/4" SCALE Size 6" X 7"
1/4" SCALE. Size 5-1/4" X 6-3/4"
Timely's original House Plan Template. CIRCLES: Heaters, drains, corners, appliances, arcs, furniture, post. RECTANGLES & SQUARES: Piers, flues, vents, panels, ducts, masonry. SPACING: Stairs, framing, tile. PLUMBING FIXTURES: Kitchen, bath, laundry. PLUS: Doors, kitchen appliances, roof pitch gauge, electric symbols and a stair planning underlay. 1/4" SCALE. Size 6-1/4" X 9-7/8"
This house plan template features an extra large selection of plumbing fixtures. Also includes kitchen and appliance symbols, door symbols, roof pitch gauge, spacing notches, electric symbols, rectangle guides, indicators and circles to 30". 1/2" SCALE. Size 6-1/4" X 10"
For drawing kitchen and bath details at a scale of 1/2" = 1". Has cabinets, counters, door swings, plumbing fixtures, electric symbols, plus edge notches for tile layout and an architects scale along one edge. 3/8" SCALE. Size 6-1/4" X 9-7/8"
Has an excellent selection of plumbing fixtures plus kitchen appliances, electric symbols and door symbols. 1/4" SCALE. Size 5-1/2" X 9-3/4"
A HOUSEFULL OF USEFUL SYMBOLS ON ONE COMPACT TEMPLATE! Standard plumbing fixtures, appliances and cabinets help visualize layout of kitchen, bath and laundry. Also includes roof pitch gauge, circles to 48", rectangles, electric symbols, doors, spacing notches, a thick lower edge and a stair planning underlay. 1/16" SCALE. Size 6-1/4" X 9-7/8S" Save paper: You can get the whole picture in a small area. These tiny symbols are also great for preliminary layout. This template actually combines 6 popular templates into one; 1. Plumbing fixtures, 2. House plan symbols, 3. Furniture, 4. Office layout, 5. Circles and squares, 6. Landscaping. 3/16" SCALE. Size 5 X 9-3/4"
This house plan template has all the standard house plan symbols with an extra measure of circles, squares and plumbing symbols. Edges have spacing notches, stair planner and a roof pitch gauge. SCALES 1/4" =1" and 1/8" = 1". Size 6 1/4" X 9-7/8"
41 circles dimensioned in scale inches NOT actual inches. Sizes from 2 to 108 inches at 1/4" scale. SCALE. Size 5-1/2" X 9-3/4"
This plumbing template has accurate scale symbols for drawing 75 fixtures. For residential, institutional, and commercial buildings. Slide-easy lower edge strip makes it easy to draw 2-part symbols. 1/2", 1/4", & 1/8" SCALE. Accurate scale symbols for both front and side views of plumbing fixtures for residential, institutional, and commercial buildings. Has slide-easy lower edge strip. 1/2" SCALE. Size 6-1/4" X 9-7/8"
Features toilets, tubs, urinals, wall-hung lavatories, countertop lavatories and pedestal lavatories. Accurate scale symbols of fixtures for drawing plan views of residential, commercial and institutional buildings. This lumbing template has the slide-easy lower edge strip. This template supersedes the T-36 template, which is still available. This plumbing template Combines three views on one template. It provides sections and elevations that match perfectly with the plan views. The template has identical symbols in 2 scales and includes 3 sizes of the international handicap symbol. 50:1 & 100:1 SCALE Size 6-1/8" X 9-3/4"
These fixtures are dimensioned in millimeters. The three views provide sections and elevations that match perfectly with the plan views. The template has identical symbols in 2 scales and has 3 sizes of the international handicap symbol. T364M PLUMBING ELEVATION and PLAN VIEW 25:1 SCALE. This template draws most of the same popular symbols as found on the T-363M, except at a larger scale. Residential and institutional lavatories, baths, toilets, and sinks. Based on AMERICAN - STANDARD products. 1:200, 1:100 & 1:50 SCALE. Size 5-7/8" X 9-3/4"
Residential and institutional lavatories, baths, toilets and showers. Based on AMERICAN-STANDARD products. All dimensions are in millimeters. 1/2", 3/8", 1/4" & 1/8"
SCALE. Size 5-7/8" X 9-3/4"
1/4" SCALE. Size 6-3/8" X 9-3/4"
This landscaping template has a large selection of symbols for planning yards and gardens. The symbols include trees & bushes, lawn & deck furniture, basketball hoop, security lighting, hedges and paving stones. Slots are provided for timbers, walls, borders, fences, benches, and culverts. Spacing notches on the edges and small plant identification symbols are useful for planning flower and vegetable gardens of any size or scale. 1/8" SCALE. Size 6-3/8" X 9-3/4"
Size 4 7/8" X 8"
Circles from 1/16" to 1 1/2". Hexes from 3/32" to 3/4". Squares from 3/32" to 5/8". 1/8" SCALE. Size 3-1/4" X 6-3/4"
For rapid layout of building items in multiples of 4, 8, and 16 in. to eight standard scales. Notched edges will center pencil point perfectly. Easy to space or estimate faming, masonry, etc. This template simplifies office layout or rearrangement in either scale. Standard size office equipment - clearly marked - makes it easy to check for space before drawing. 1/8" SCALE. Size 5-1/2" X 9-3/4"
Has 15 circles and squares in common sizes up to 60". Outline notches allow easy spacing for 12, 16 and 18 inches. Also has roof pitch gauge, rectangle guides and slide-easy lower edge strip. EXCELLENT FOR LARGE RESIDENCES, INDUSTRIAL BUILDINGS, MOTELS, HOTELS, RESORTS, APARTMENTS, INSTITUTIONAL BUILDINGS. This furniture template enables the designer to quickly visualize furniture space and adaptability. An insert with the template illustrates 65 pieces of furniture that can be drawn. Gives width, depth and height of each. 1/8" SCALE. Size 3-3/4" X 4-3/4"
Same cut-out arrangement as T-130 except without printing or instructions. 1/4" SCALE. Size 6-1/4" X 9-7/8" ONE OF OUR NEWEST FURNITURE TEMPLATES. Plan your kitchen, dining room, living room, office area and bedrooms for optimum comfort and appearance. An assortment of circles and squares are provided for drawing accessories, appliances and special details unique to each home. An architects scale is printed along the top edge. 1/8" SCALE. Size 5" X 9-5/8"
ONE OF OUR NEWEST FURNITURE TEMPLATES. Plan your kitchen, dining room, living room, office area and bedrooms for optimum comfort and appearance. An assortment of circles and squares are provided for drawing accessories, appliances and special details unique to each home. An architects scale is printed along the top edge. Slide-easy lower strips. Draws 14 standard sizes of traverse windows. Large selection of valves and operators 1/4" and 3/6" long. Complete valve symbols plus 14 pumps and drivers. Size 4 3/8" X 6 7/8"
Set of two templates of widely used symbols for the petroleum and chemical industries. For use in many phases of production planning and time study. ASME standard 101 based symbols from 1/8" to 3/4". Full size and 3/4 size symbols. Size 3 5/8" x 7 1/2"
1/4", 3/8", 1/2" and 5/8" size symbols. Six sizes of symbols from 1/4 size to full size. Based on Mil. Std. 806C and ANSI Y32.14. Size 3 7/8" X 7 1/2"
Circles from 1/16" to1 1/4". Hexes from 3/32 to 5/8"
27 circles from 2 to 30mm, triangles, squares and isometric ellipses to 25mm, hexes from 2 to 22mm. Size 5 1/2" X 6 3/4"
Set of two templates includes isometric squares and hexagons 1/16" to 1 1/4". Size 6 1/4" X 9 3/4"
Major axes 1/16 to 1/2. Projection 10 to 70 degrees. 252 perfect cut-outs. Size 4 1/2" X 7"
Full circles 1/16 to 1 1/18, quarter circles to 2 1/4 diameter.Full and half size hexagons for 3/16 to 1/2 bolt diameters. This template can be used to draw 10 symbol sizes from 1/4 to 4-1/4 inches high. You can indicate handicap facilities on drawings or on the facility itself. 40 squares from 1/6" to 2". Size 6 7/16" X 9 7/8"
Set of two templates for jewelry designers and gem cutters. The cut-outs can be used as either a visual gauge or drawing tool. 1/4" & 1/8" SCALE. Size 6-1/4" X 97/8"
41 squares dimensioned in scale inches. NOT actual inches. Sizes from 2 to 108 inches at 1/4" scale. Many sizes are not on a regular square templates. Makes drawing squares or marking small dimensions quick, easy, accurate and consistent. Has pin-point centering. 41 squares dimensioned in scale inches NOT actual inches. Sizes from 2 to 108 inches at 1/4" scale. 39 accurate squares from from 2 to 45mm. Size 6 3/8" X 10 3/8"
Rectangles from 1/16" x 1/8" to 2 3/8" x 4 3/4"
Rectangles from 1/16" x 1/8" to 1 1/4" x 2". Rectangles from 2 x 3mm to 35 x 55mm. Circles match slot widths to give perfect fit for bolt or pin. Slots from 1/16" x 3/32" to 3/4" x 1 1/2". Large selection of arrowheads from 3/32 to 15/16. Size 6 1/4" X 10"
Brackets and pointer symbols in ten sizes. Tangent 90 degree corners 1/32" to 2 1/2" radius. Rectangles from 1/16" x 1/8" to 1/2" x1"
Size 3 7/8" X 7-3/4"
47 sizes from 1/32" to 4". 36 circles from 1/32" to 1 1/8". 33 circles from 1 to 25mm. Size 4 3/4" X 8"
39 circles 3/64" to 1 5/8". 43 metric circles 1 to 30mm. Size 6 1/2" X 10 1/2"
Circles from 2 3/8" to 3". Complements T-88. Circles from 55 to 80mm. 42 circles from 1/16" to 2 1/4". 1/4" & 1/8" SCALE. Size 6-1/4" X 9-7/8"
41 precision circles dimensioned in scale inches. NOT actual inches. Sizes are from 2 to 108 inches at 1/4" scale. 50 metric circles from 1 to 50mm. 85 circles from 1/32" to 1 1/4" diameter. Size 6 3/8" X 9 7/8"
78 precision circles from 1 to 30mm. Circles from 1/8" to 2 1/4". Size 7 3/8"" X 9 1/4"
Circles from 1/16" to 3". Circles from 1 1/4" to 3 1/2". Size 6 1/4" X 9 7/8" X .025"
Full circles to 1" and quarter circles to 8 1/4". 73 precision decimal circles from .050 to 1.140 diameter. Major axes 1/8 to 1. 5 projections: 15, 30, 45, 60 degrees plus isometric. Size 4 3/4" X 6"
Major axes 1/16 to 3/8. Projections 15 to 60 degree. These tiny ellipses provide an inexpensive way to enhance a 92-A or 92-B set. Major axes 3/8 to 2 1/2. 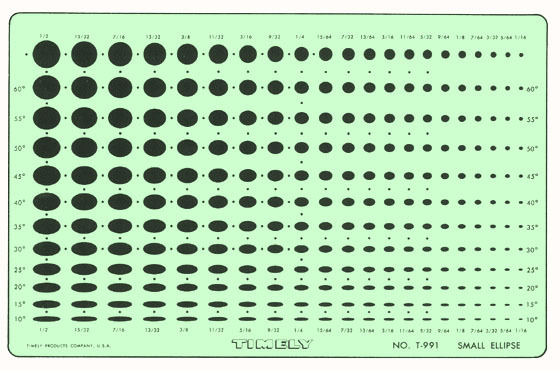 5 and 10 degree ellipses on one template. Ideal addition to the T-92-A set. 3/32 to 1 9/16 axes. All are 35-16' projection. 1 to 7 1/2 axes. All are 35-16' projection. Dimensions are for isometric projections. 1/16 to 2 1/2 axes. All are 35-16' projection. Major axes 1 to 45mm. 44 ellipses 35-16' projection. Major axes 2 to 12mm. 12 Projections 10 to 70 degrees. Major axes 1/16 to 5/16. Projections 10 to 70 degrees plus circles. Size 6" X 10" each template. Size 6 1/4" X 10 7/16" each template. Size 10" X 6" each template. 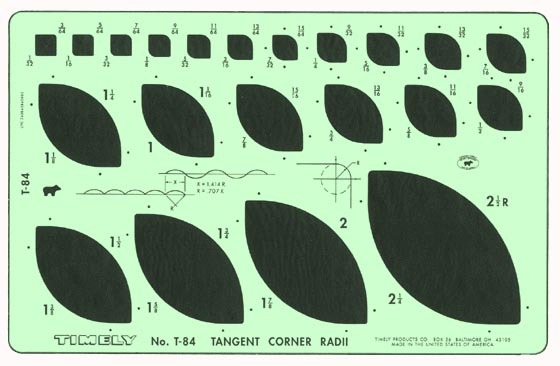 T-93-10 Individual templates 10 degrees. Set of 5 templates. 15 sizes in 13 projections, from 10 derees to 90 degrees. Set of 2 templates. Major axes 7/16 to 1 1/8. 13 projections 10 to 90 degrees. 130 precise ellipses. Size 4 1/2" X 8"
Set of four templates. Major axes 1 1/4 tru 6 1/2. 4 projections 16, 30, 45, 60 degrees. 60 different curves. Size 3 1/2" X 9 3/8"